Winter Romance | Kappa Kappa Kappa, Inc.
"Winter Romance" by Derek Smith is H 15” x W 19” and was purchased in 1960 for $125 and appraised for $1400. 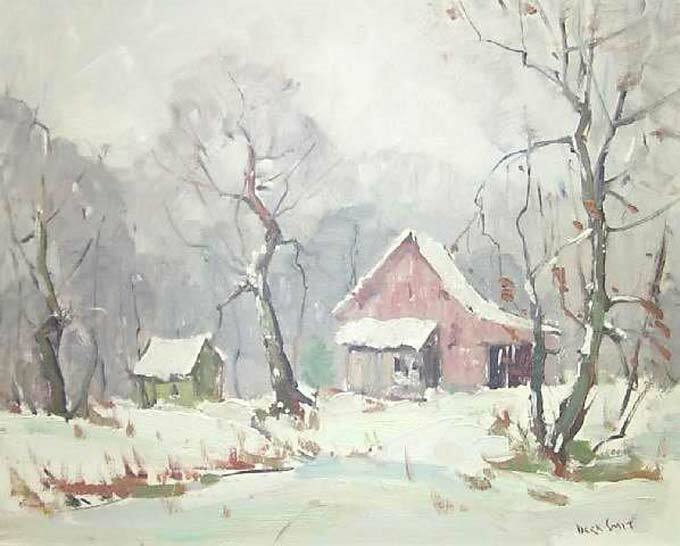 The painting is oil on fiberboard and shows a winter landscape with an old house and outbuilding in the middle which is painted in grays and whites. Derek Smith was a native of Amsterdam, Netherlands and his art education included study in Holland and Germany. He served in World War I for the United States and then studied at the Academy of Fine Arts, Chicago Art Institute, and with Joseph Allworthy. He was a member of the Chicago Painters and Sculptors’ Association, the Chicago Gallery, the Hoosier Salon, Indiana Artists Club, and the Brown County Art Gallery Association. He died in 1985 at the age of 96. Repairs to this fourteenth to be restored painting included cleaning the grime layer off.